The dump trucks are widely used in the mining industry, since they are the most efficient vehicles for disposal of loose materials. These heavy-duty trucks are ideal for all materials that cannot be transported with an open-bed truck. The demand for high-capacity trucks which provide high productivity is greatly increasing. Manufacturers of dump trucks are constantly working on producing bigger and more efficient dump trucks. Do you know which are the largest dump trucks on the market? If not, continue reading to discover the world’s largest dumping truck for sale. Belaz 75710 – Introduced on the market in 2013, the Belaz 75710 is the world’s largest dump truck. This beast has a payload capacity of 450 tonnes. The Belaz 75710 is an ultra class heavy-duty truck with two 16-cylinder turbocharged diesel engines, each providing a total power output of 2,300 horsepower. It has 8 gigantic tires that enable the truck to carry massive loads. Designed with electro-mechanical transmission, the Belaz 75710 can reach a top speed of 103 km/h. However, all these amazing and powerful features don’t come cheap. The price tag for this dump truck is $6 million. 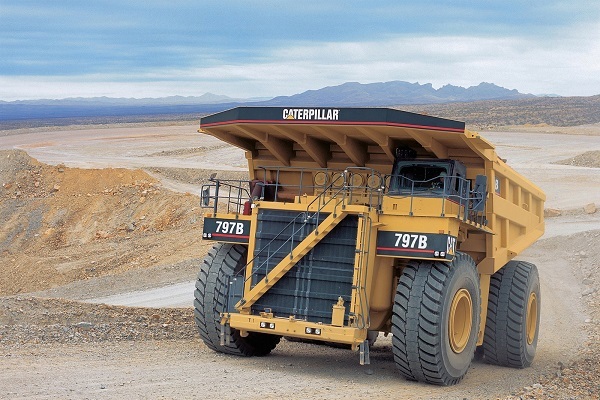 Caterpillar 797F – The second largest dump truck is Caterpillar 797F. This massive dump truck is a two-axle, top class, mechanical powertrain haul truck, developed by one of the world’s most reputable heavy-equipment manufacturers. The Caterpillar 797F is designed for heavy-duty construction and high-production mining applications, with a payload capacity of 363 tonnes, power output of 4,000 horsepower and a top speed of 109 km/h. It comes with a 20-cylinder CAT C175-20 turbocharged diesel engine, and a hydraulic torque converter transmission. Like any other heavy-duty dumping truck for sale, this machine comes with astronomical price tag. Be ready to spend around $5 million if you want to have this dump truck. Bucyrus (Terex) MT6300AC – Another heavyweight dump truck that’s worth to be mentioned is the Bucyrus MT6300AC. Presented in 2008 by Terex, but later re-branded as Bucyrus MT6300AC in 2010, this monster of a dump truck provides a payload capacity of 400 tonnes. The Bucyrus MT6300AC is a ultra class dump truck, equipped with a 20-cylinder 4-stroke diesel engine that provides 3,750 horsepower and a top speed of 103 km/h. It is ideal machine for difficult mining operations The Bucyrus MT6300AC has a gross operating weight of 598 tonnes, and its body is 14.63m long and 7.92m in height. These amazing figures are making Bucyrus MT6300AC one of the most popular and largest dumping truck for sale on the market. Depending on the features included, the price tag of this truck ranges from $4 to $5 million.